A healing sunscreen that is totally free of all chemicals known to contribute to skin cancer. 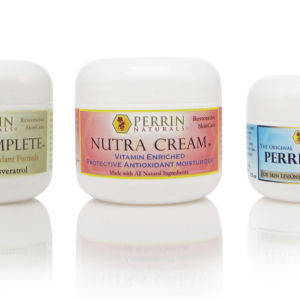 Perrin Naturals – All Natural Sunscreen uses 100% natural ingredients that protect your skin from sun-damage and also restore previously damaged skin. Please be aware that in Australia sunscreens are not required to list all ingredients and that any sunscreen with more than SPF 15/20 will contain known carcinogenic (cancer causing) ingredients. 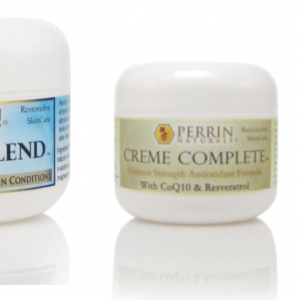 Perrin Naturals – All Natural Sunscreen however only has Zinc oxide. Which is a totally natural ingredient which deflects the rays of the sun and prevents then from penetrating into your skin. Formulated in a base of organic aloe vera, vegetable oils, beeswax, and organic shea butter. It is enriched with antioxidants and vitamins that assist your skin to resist the negative effects of sun exposure and restore previously damaged skin to normal function. Organic Coconut Oil, Organic Shea Butter, Organic Jojoba Oil are all natural edible oils that have sunblocking functions. Vitamins C and E. Studies show vitamin C and E help to protect against ultraviolet damage when applied topically. Grape Seed Extract and Resveratrol help to correct existing sun damage and provide antioxidant protection to prevent damage caused by UV rays. Essentials oils of Vanilla, Cinnamon, Bergamot, Patchouli. A higher SPF rating requires a lot more sunscreen chemicals for not a lot more hours of sun protection. SPF 15 blocks 93% while SPF 30 blocks 97% of UV radiation. SPF 15 means that if i burn after 15 minutes of direct sun exposure I will be protected by SPF15 for about 4 hours. If i used SPF30 I would be protected for about 8 hours. It important to note that the thickness of sunscreen applied will increase the length of protection time. 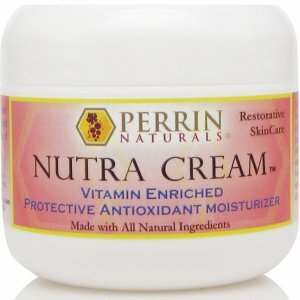 If you are thinking wow its twice as strong you are correct – however this increase in time between applications means that some pretty scary chemicals are used – below is a list of ingredients based on weight used in a typical SPF30/50 sunscreen – NONE of these are in Perrin Naturals Sunscreen. In Australia not all of these will be listed on your sunscreen label because its not required by law. This is the best sunscreen i have ever used, whenever i forget it and have to use some other sunscreen i notice that my skin feels hot and inflammed. It seems to last a long time and i notice that i don’t have to reapply as often as i did with my old supermarket sunscreen. Using this and the creme complete my skin is normal colour – not bright inflammed red… It also keeps my skin more moist. 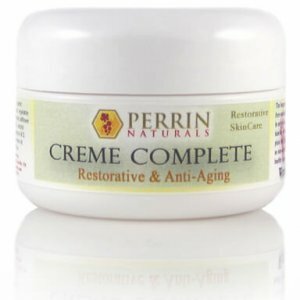 I use the perrins sunscreen everyday and then creme complete at night. Brilliant stuff!